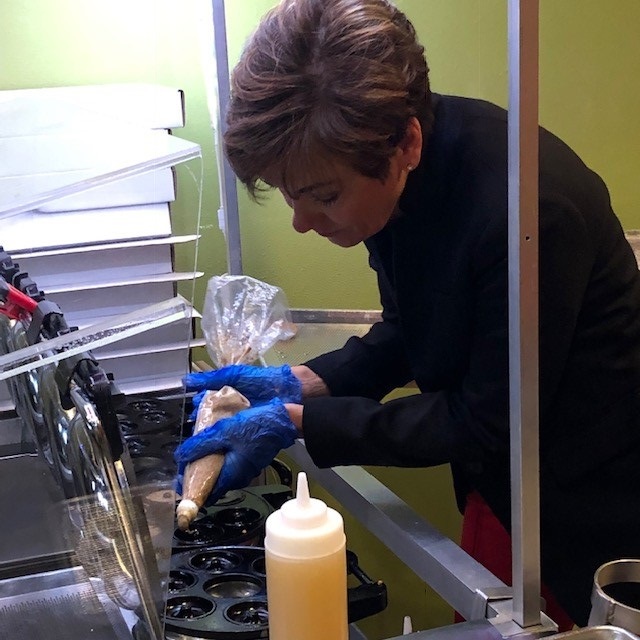 Governor Kim Reynolds traveled to southeast Iowa Friday to visit a small business launched by a couple of Florida transplants. Carson King and his son, Zach, moved to Iowa about a year ago to open ‘Oh Donuts’ in Sigourney. Reynolds said her visit to the unique donut shot gave her an idea. “I’d like to have a ‘Startup Day’ at the Capitol and have startup companies from all across the state come in, just talk about what they’re doing, what’s working, maybe what some of the barriers are – so legislators have a chance to hear first-hand,” Reynolds said. Reynolds also got to try her hand at making donuts. She said it’s a skill sure to make her more popular with her grandkids.